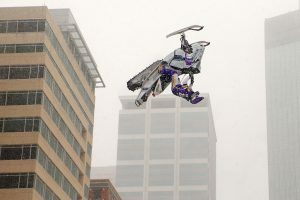 MINNEAPOLIS (Feb. 3, 2018) — As part of the Super Bowl LII weekend events on Saturday, Levi LaVallee completed his signature backflip jump over Super Bowl LIVE on Nicollet Mall at 11th Street. 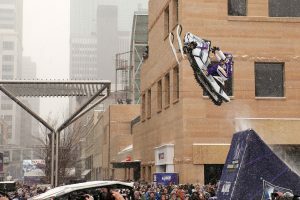 As part of the Polaris UpsideDowntown, the snowmobile stunt show featured LaVallee, along with three other professional snowmobile athletes: Josh Penner, Justin Hoyer, and Fred Rasmussen. LaVallee concluded the show with a backflip on his snowmobile, launching nearly 100 feet between two ramps. 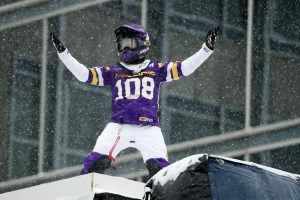 A native Minnesotan, LaVallee holds the world record for snowmobile distance jump and is a seven-time gold medalist at ESPN Winter X Games (13 total medals). Photos and video courtesy of the Minneapolis Star Tribune.